Lab created diamond isn’t the same as cubic zirconia, although some people assume it is. Diamonds that are created in a lab are also referred to as man-made diamonds and synthetic diamonds, which can cause confusion among consumers. What’s the difference between lab created diamond vs cubic zirconia? We will cover the most important differences between the two below, so you will have a better idea of what you’re buying. Cubic zirconia is a form of zirconium dioxide that’s made synthetically, whereas lab created diamonds are pure crystallized carbon diamonds created in a controlled laboratory environment. Lab created diamond vs cubic zirconia are the same in this regard; they are both created synthetically. Lab created diamond has Carbon atoms arranged in a crystal structure characteristic of mined diamonds. It’s their properties that vary vastly. Because its appearance is similar to diamonds, cubic zirconia is often used as a substitute or imitation. Those who want the look of diamonds without the cost can buy cubic zirconia jewelry. Cubic zirconia is usually colorless. The most expensive diamonds are colorless, making it a desirable characteristic. Are Lab Created Diamond and Cubic Zirconia Fake? 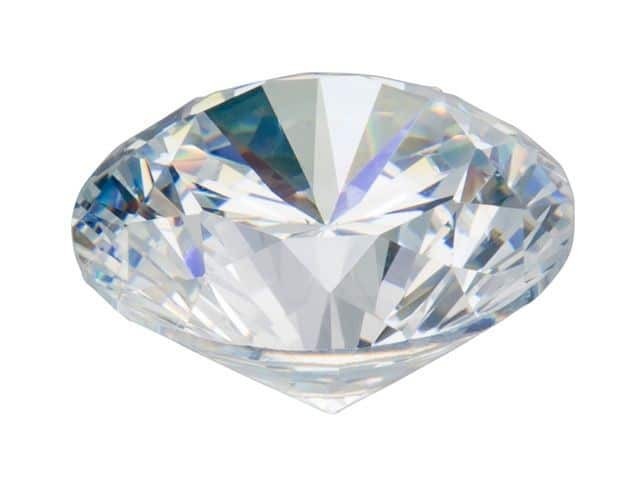 One of the most important differences between lab created diamond vs cubic zirconia is lab created diamonds are not viewed as fake in the jewelry industry. They are deemed real diamonds because they have identical chemical composition and physical properties as mined diamonds. Lab created diamond also has the same optical properties as mined diamond. Some companies in the diamond industry call lab created diamond “synthetic diamond.” This term is misleading because it causes people to think they aren’t real diamonds, when they actually are. The only difference is lab created diamond is created in a controlled laboratory environment instead of in the Earth by nature. Cubic zirconia is a diamond simulant. This means they are created to mimic the appearance of natural diamond. Cubic zirconia is classified as non-precious. It doesn’t contain diamond either. Cubic zirconia is the most well-known diamond simulant, but there are other options in simulants, such as moissanite. Another key difference between lab created diamond vs cubic zirconia is hardness. Lab created diamond is significantly harder than cubic zirconia. Diamonds are known as one of the hardest gemstones, and since lab created diamond has the same properties, they have the same hardness. Lab created diamond rates 10 on the Mohs hardness scale, compared to cubic zirconia’s rating of 8.5. Consequently, cubic zirconia is less durable than lab created diamond. It will scratch easier. Cubic zirconia has softer edges than lab created diamond due to having a lower hardness. Mined diamonds have sharp edges; thus, lab created diamond also has sharp edges. As time goes on, cubic zirconia’s edges become softer and more rounded from wear and tear. In the jewelry industry, this is viewed as a weakness since sharp faceted edges are desirable. Fire, a quality that diamonds are known for, differs between lab created diamond and cubic zirconia. You might assume that lab created diamond has better fire than cubic zirconia, but this is one area in which cubic zirconia has a higher rating. In gemology, fire is flashes of color from how the gemstone breaks down light. It’s easy to differentiate between lab created diamond versus cubic zirconia with a diamond tester because their conductive properties vary greatly. A diamond tester will let you know with certainty if a gemstone is a real diamond, whether it was lab created or mined. However, it is not designed to tell you if the gemstone is cubic zirconia. The diamond tester will just let you know the stone isn’t a diamond. Lab created diamond and cubic zirconia are similar when it comes to color. The synthetic process used to make the gemstones causes them to be clearer. Cubic zirconia, however, is usually more colorless than natural diamonds. Because they have the same chemical composition and physical properties as mined diamond, lab created diamond is more expensive than cubic zirconia. They aren’t as expensive as mined diamond since they aren’t as costly to produce. But, lab created diamond is still expensive in comparison to cubic zirconia. Diamond simulants like cubic zirconia are helpful when there’s a certain piece of diamond jewelry you want but can’t afford yet. You can wear a diamond simulant until you have the money to buy a real diamond piece. Another benefit of diamond simulants is having an alternative you can wear if you travel a lot or don’t want your wedding ring to be damaged during an event. You can still let people know you’re married without risking losing the ring. Lab created diamonds are ideal for people who want real diamonds at a lower cost and don’t mind that it’s created in a laboratory rather than mined from the Earth. This type of diamond is an excellent choice for those who are against mining. They can still enjoy diamond jewelry while having peace of mind they’re not contributing to the mining industry. Lab created diamonds are so close to mined diamonds that professionals have a difficult time differentiating them even with gemological equipment. It requires extensive scientific testing with specialized equipment to determine whether or not a diamond was man-made or mined. However, most lab created diamond jewelry comes with a certification that states they were grown in a laboratory. Lab created diamond and cubic zirconia may look like diamonds but only lab created diamond is a real diamond. Cubic zirconia is a simulant with a significantly lower cost. And while it has more fire than lab created diamond, the drawbacks are it’s not a real diamond and it’s not as durable as diamonds. Cubic zirconia’s faceted edges are softer than that of lab created diamond as well. As a result, a lab created diamond is a better option for those that can afford paying a higher price.